My husband forwarded me a website yesterday by the name of Perpetual Kid. They have a ton of random gag gifts and novelty items to choose from. Most of them are something you would throw in your junk draw after a week, but some of them are actually memorable and funny…or maybe it’s just me. 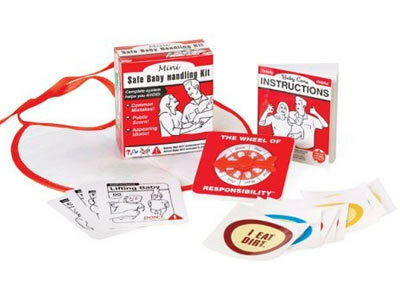 The Mini Safe Baby Handling Kit (see picture) for example got my attention because it reminded me of when our friends were given a kit like this and how we were cracked up reading the riduculous quotes and baby warnings that were written on each sticker. I’m not sure if this is the same kit or not, but it still made me smile and reminisce of our laughter fest awhile back. Perpetual Kid explains their product to “Make new parenthood a blast! Included here are hilarious “do’s and don’ts” on caring for your bundle of joy, a small “Who’s gonna do it?” spinner to help parents negotiate childrearing duties, and other components that will keep moms and dads laughing during the sleepless nights.” Now don’t you just want to go out and buy it?